I got this recipe from The Guide to Good Food by Robinsons Supermarket. The title of the original recipe was “Tofu-Pork with Kinchay and Tausi.” I used chicken, instead of pork, hence the change in title. 1. Heat oil in a skillet. 2. Fry tofu until golden brown then set aside. 3. In the same skillet after removing excess oil, sauté garlic and onion. 4. Add chicken and cook for 10 minutes in covered skillet. 5. Add tausi and water. Simmer for 5 minutes. 6. Add kinchay. Cook for a minute then add the cornstarch mixture and mix well. 7. Toss fried tofu until well coated with sauce. Serve hot. 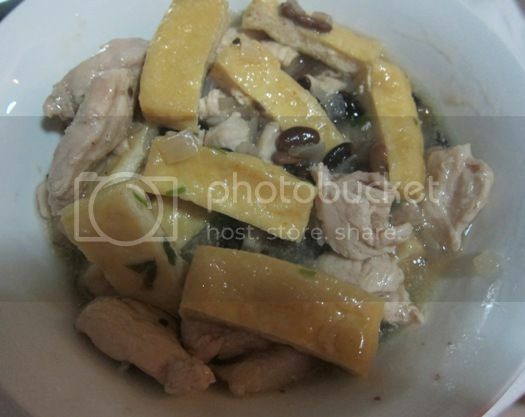 This entry was posted in Chinese Cuisine, Home-cooked Dish. Bookmark the permalink.